iDevices used as remote controls are not new but many teachers are now looking at how some of the new robotic devices can be used as part of their normal teaching and learning. We recently purchased both the Sphero and the iConCopter and have used both to good effect - although the iConCopter was a personal purchase. I thought it might be handy to have a look at some of the suitable options available. Obviously because of the costs these are items that may need to be planned for in the budget. They may not be appropriate as a whole class set but rather as two or three of one or more of these options that can then be used as kits for special projects or specific units of work. The Sphero and Tankbot would be good to use with Maths, setting out the steps required to get through a maze - especially with the drawing feature in the Sphero. Let me know if you are using any other appropriate devices that we have not mentioned here. Sphero by Orbotix is the world's first robotic ball and gaming device that you control with a tilt, touch, or swing on your iPhone, iPad, or iPod touch. Easily connect to Sphero via Bluetooth, then dive into unique, mixed-reality gameplay using fun and challenging built-for-Sphero apps. 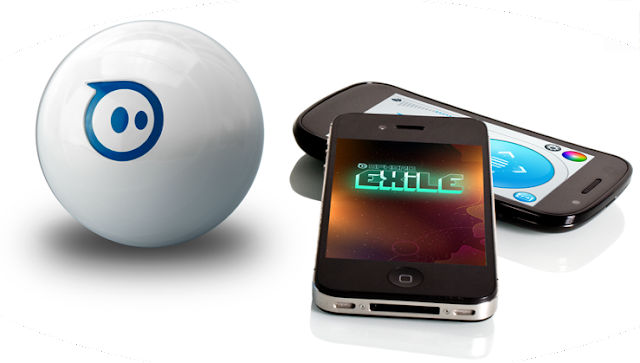 You can control Sphero wirelessly from any of your iOS devices or you can use Sphero as a controller for on-screen games. The device has been engineered in such a way to encourage developers to make games for the device. 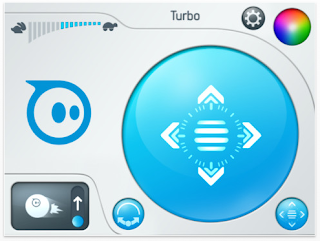 The intuitive controls are easy for all ages to learn once they download the free Sphero app. Sphero can be used on wood or tile floors, sidewalks, carpet making it one of the most versatile app controlled gadgets for use in schools. 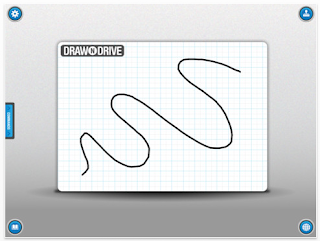 I especially like the feature that allows students to draw a track that Sphero then follows. Presenting the i-Wheels Micro Robot. This is a unique design for a remote controlled device. The robot has been constructed in such a way that it can not fall over even with just two wheels. Not only does the iWheel come in four super bright colours but it is also controlled by any of your iDevices using the "i-Robot" app from App Store. 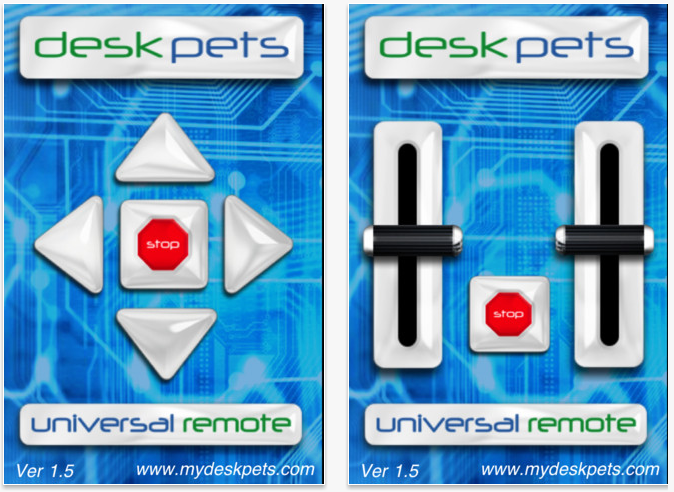 It looks very easy to control, allowing you to go forward / backward, turn left / right, rotate CW / CCW. Like a lot of these robots, the learning curve may be steep for the adults in the class. Great for mazes or maneuvering over a set track. These six legged robots are also made for HeliPal.com and happens to use the same app as the iWheels micro robot. 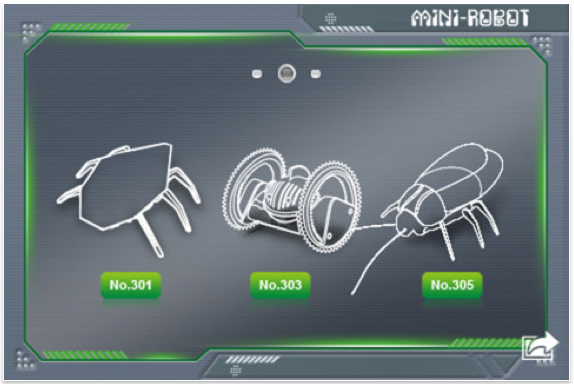 Inspired by the movement and characteristics of an insect, the insect-like legs are manipulated by the internal structure inside and powered by a small rechargeable battery. 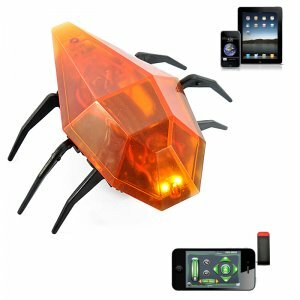 Charge your Bug via the included USB cable and start controlling it using your iPhone, iPad or iPod. The IR transmitter allows you to control the bug up to a distance of 6 meters. I really like this new toy for robot enthusiasts called TankBot. It offers infrared sensors that allow the micro-vehicle to navigate mazes, and a universal remote that plugs in to the headphone jack of an iOS or Andriod device. The TankBots also play sounds and blink when idle, and feature three modes of play. In addition to the autonomous maze-solving mode, the toy can be set to free-roaming, acting under its own direction, as well as controller mode under the direction of an iOS or Andriod app. Each unit has a retractable USB charger built right into the body of the product, meaning no additional batteries are required. The company says that 40 minutes of charging will yield about 15 minutes of play time. 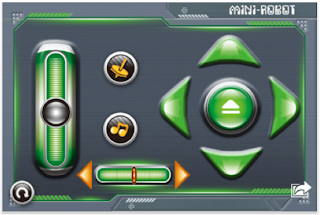 The companion app allows users to control the unit using a virtual "joystick". This is another robot I might have to purchase myself. Romo is billed as a revolutionary mobile robotic platform that uses your smartphone as its brain. 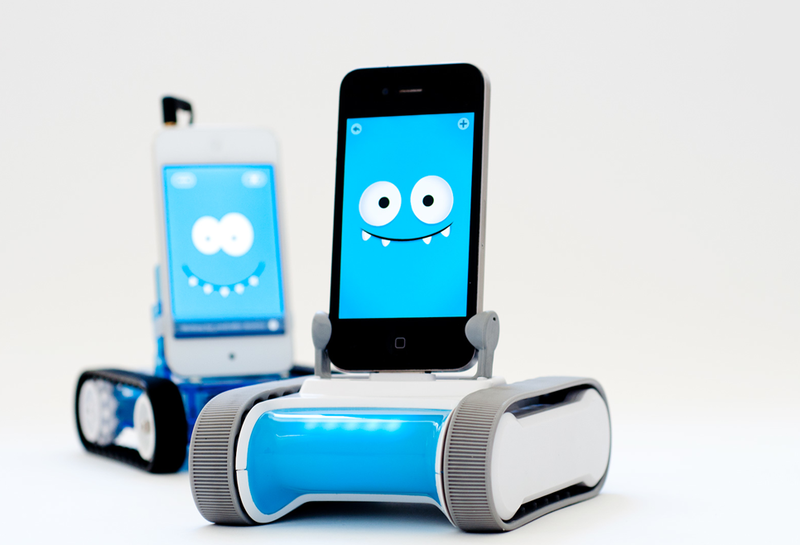 When connected with any iOS device, Romo becomes a friendly robotic avatar that wanders about your home or office. Romo is the first personal robot built for everyone. He’s small but sturdy, fast, and his basic interactions evolve the more you use him. By combining smartphones with a mobile base, they have created robots that do awesome things (telepresence, autonomous navigation, machine vision). 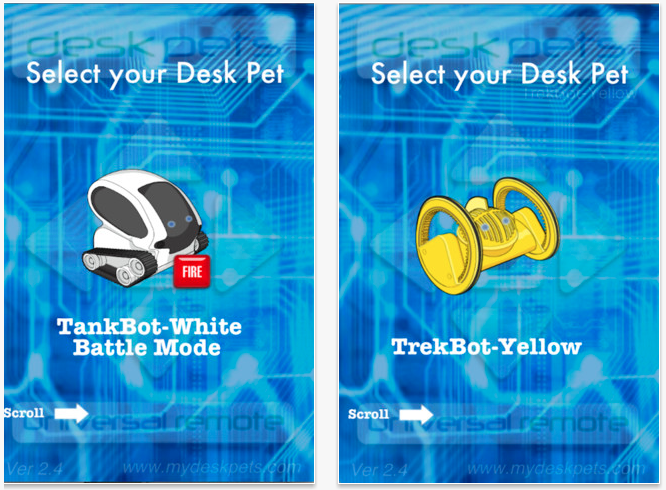 Because software for Romo is distributed through the Apple App Store users download new behaviors and personalities for their robots at the click of a button. Anyone can build and distribute new apps for Romo using the Romotive SDK. This is being actively encouraged by the manufacturers. I also like that this was a Kickstarter project. This is a bit over the top but easily fits into the notion of a iPhone control device. The AR.Drone 2.0 remote-control quadricopter combines the best of many worlds, including modeling, video gaming and augmented reality. 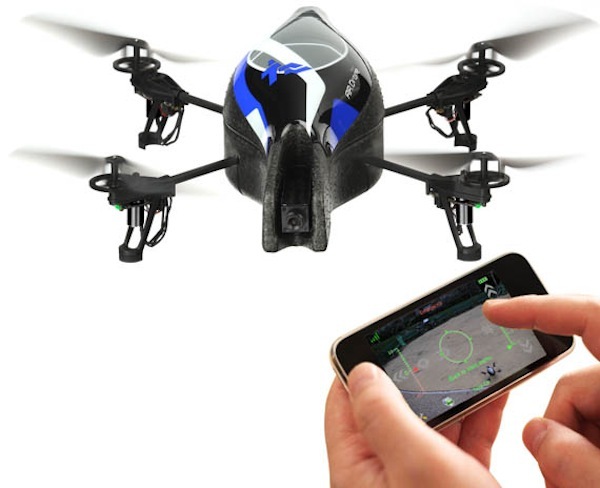 The AR.Drone 2.0 is remote-controlled by an iPhone or iPad and features a number of sensors, including a high-definition front camera, vertical camera, an ultrasound altimeter and absolute control mode. With the AR Drone 2.0, you can now record video and take pictures while in-flight and directly share them on Youtube and Picasa. You can also use the AR.Drone in video games, such as AR.Race, a one or two-player game using an obstacle course. At roughly $299 AU it is out of the price range of most schools, but it might be worth discussing with other faculties as a shared purchase. This would be especially good for promotional shots of the school grounds, the full student body or even football games and promotional events like fairs, Open Days and Sports Carnivals. Students absolutely love the integration of technology into the classroom and really respond to it. Smart boards were the first innovative addition now it is robotics.